With all the nice warm weather in northern California, I decided that I wanted to build a few patio chairs to be able to enjoy evenings outside. With a limited budget (both time and money) I didn’t want to purchase expensive lumber from the hardware store and have to worry about staining or sealing the wood. Instead I opted to look around town for some reused wood in the form of pallets, since I personally like the look of weathered bare wood. Pallets seemed like a perfect building material, being cheap and seemingly readily available. 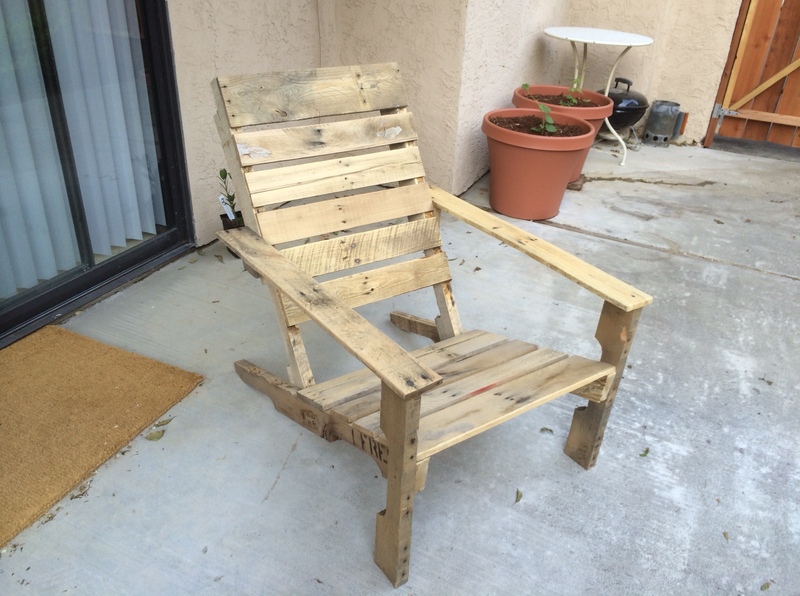 There also exist plenty of online videos and tutorials showing you how to make alternative furniture from pallet wood. So I went to my local hardware store to see if they had any old pallets that I could have for free. There was a huge pile of pallets stashed in their stockyard that I had noticed a few weeks ago while buying wood for another project. Unfortunately, like many other businesses that receive large shipments of goods stacked on top of shipping pallets, the vendors wanted those pallets back. As it was explained to me by an employee from the hardware store, for every pallet of goods that the hardware store received, they had to turn around and give back an empty pallet to the vendor. 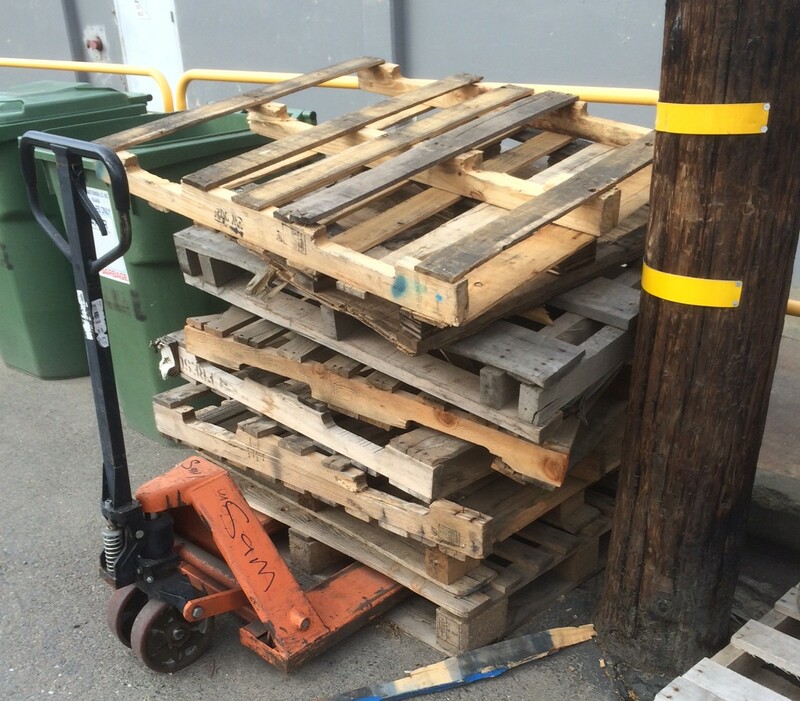 A little dismayed, I asked a local community market if they had any free pallets. After talking to the employee responsible for “shipping and receiving” I was shown a pile of old pallets that none of the vendors wanted. Eager and excited to get to work, I snatched up three pallets and crammed them into the trunk of my car. Moral of the story: don’t assume a pile of pallets are free for the taking, be sure to ask first and try you local grocery store! Stack of pallets behind grocery store. With the pallets in hand, I looked up instructions for building the patio chairs and stumbled across plans written by Jared Erwin on Houzz.com. The webpage provides instructions, dimensions, and lots of reference pictures and is a great resource for anyone who wants to build their own patio-style chairs. Building the chair only took about an hour. It was a fast and easy project, and while not required, the use of power tools make the project even easier/faster. I used a cordless drill to create pilot holes for the wood screws to avoid splitting the pallet wood and a circular saw to cut all the pieces to size. For the slats on the back and bottom of the chair I used a nail gun with 18-gauge brads and wood glue to minimize the use of screws. Once the chairs were fully assembled, I sanded them with 60-grit sandpaper to remove splinters and round the edges. One thing to note: it’s possible that the pallet wood may have been treated with chemicals to protect it so it’s not a bad idea to use a protective respiratory mask and safety glasses when cutting and sanding the wood. That’s one of the negatives of using the pallets as a source of wood for building projects. Wood screws used to secure legs and arms of chair. The most frustrating part of the entire project was taking apart the pallets (the nails are often rusty, so be careful!). 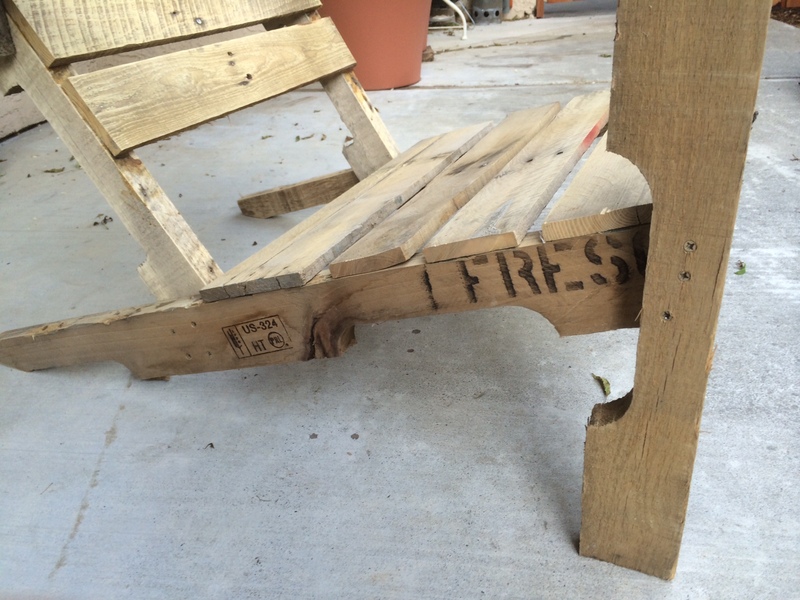 To make one chair required two pallets. I only had a hammer and a pry bar to disassemble the pallets, but with this method, for every two boards I ripped off the pallet I ended up breaking or splitting another board. Here’s a link to a tool you can build to make the process easier. I still want to assemble a few more chairs so I’m planning on building a tool like this before wasting anymore time using the hammer and pry bar again. You can also purchase a tool that does the same thing for around $70. All-and-all, this is a fun and easy project that you can complete in an afternoon if you have the right tools. I’m looking forward to making a few more chairs and maybe even a small couch so my friends and I can enjoy the nice summer weather on my patio.